If you happen to be a content creator on YouTube, things are changing in the coming weeks that you should take note of. In total, there are six things being added for those in charge of a channel, each of which should benefit not only you, but your community as a whole. YouTube lists three changes for the interaction side of things, then three behind-the-scenes changes that can help make your channel a better place for people to be. 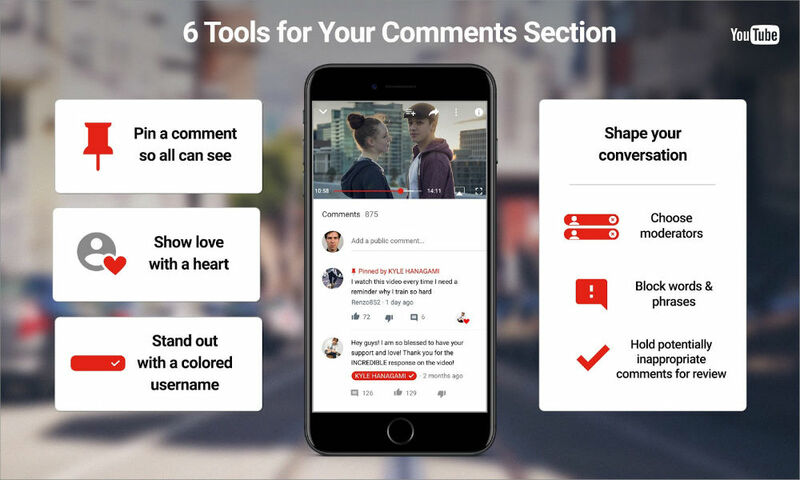 For interactions, YouTube will soon allow creators to pin select comments to the top of a comment section, granting an easy way to steer a conversation. This same functionality is already built directly into websites you may frequent, including this one. Additionally, should a creator want to acknowledge a comment, but not exert too much effort, they can now simply “heart” a comment. Also, from time to time, you may a see a fake account trying to represent the creator. YouTube hopes to diminish this by allowing creators to use a unique color username in a comments section. Behind the scenes, creators can now choose moderators for comments, block words and phrases, as well as hide potentially inappropriate comments for review. These specific changes should create a potentially safer place for all viewers. To see more about these changes, check out YouTube’s blog post.